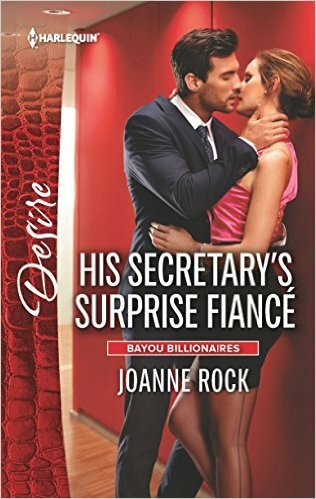 His Secretary's Surprise Fiance is the second book in a series written by both Catherine Mann and Joanne Rock. The Bayou Billionaires series involves four brothers, so it would be recommended to read in order. The complete series is His Pregnant Princess Bride by Ms. Mann, His Secretary's Surprise Fiance by Ms. Rock, Reunited with the Rebel Billionaire by Ms. Mann and Secret Baby Scandal by Ms. Rock. Adelaide Thibodeaux had had enough. She had put her dreams on hold to help her childhood friend, Dempsey Reynaud, build his career. She was now his personal assistant, but she wanted to pursue her own career, independent of him. After all, he seemed to easily be able to live his social life independent of her. Dempsey needed Adelaide. She had always been there for him. First, when they had grown up in poverty. Later, after he'd been swept away into a lavish lifestyle courtesy of his father's discovery of his existence. And now, as he coached. No matter what life threw him, he knew he'd have Adelaide at his side. Until the day she said she quit. He had only one comeback for that. To announce their engagement at a news conference. Only problem was Dempsey's lack of proposal to Adelaide, but he knew he could work this out. His plan was for a temporary engagement, only long enough to convince her to stay with him, as his personal assistant. His Secretary's Surprise Fiance was a best friends romance where two individuals fight to become one. Dempsey didn't begin as the perfect hero for Adelaide. He had essentially taken her for granted for several years. It takes the knowledge that he is losing her, or at least losing her in the day-to-day capacity that wakes him up. Adelaide, meanwhile, has had enough and is determined to make a change. Luckily for her, and rather entertainingly for readers, Dempsey takes the blow and it knocks some sense into him. I am eager now for the third Dempsey brother to see how he reunites with his wife.